Company of professional roving and roaming actors. An essential start to formal or informal awards nights, Hollywood, 1920's, 1950's, Las Vegas, super hero and Broadway themed parties or events, product launches and many other corporate functions. 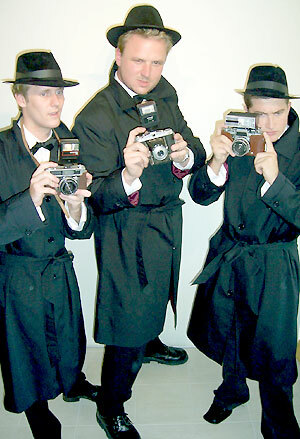 Decked out in classic trench coats, hats, notepads and pop flash cameras, let this group of pushy reporters hassle your guests as they attempt to make a star entrance to your event. They'll be asking all the nasty questions pushing for some juicy gossip they can write up for the papers. "Can you tell me more about your affair with Pamela Anderson?" "Was it you we saw attempting to jump from the top of Centrepoint Tower last Friday night?" "Which designer did you sleep with to get hold of that fabulous dress?" "Hey look it's Rock Hudson! Where have you been hiding all this time?" It's a great way to make your guests feel like a celebrity as they walk up the red carpet and makes for an ideal conversation starter. The paparazzi were great and a huge hit with everyone. Thank you so much. The actors were great! Everyone loved them. They were exactly what I was hoping for.